A short while ago, we published a blog post about the appearance of religious items on ISS, especially in the Russian command module Zvezda. We thought it would be worthwhile going beyond that anecdotal discussion, to see if we could quantify and analyze the appearance of cultural items in that location. We created a database in Microsoft Access and catalogued 414 instances of items being displayed across 48 historic images from the NASA Flickr site dating between 2000-2014. The locations of the items in the aft space of Zvezda were also recorded, so that their appearance, disappearance, movement, and relationships to other items and the space could be assessed. Our preliminary results, which can fairly be called the first systematic study of the material culture of a human space habitat, reveal interesting and important patterns. First, the items appeared in waves, rather than simultaneously or at a steady pace. Particular periods of large numbers of items on display occurred in November 2002 and early 2008 through the end of 2009, while correspondingly few items appeared between 2004 and 2005, and again in 2011-2012. The number of items on display in the aft end of Zvezda between 2000 and 2014. As noted, we were particularly struck by the display of religious items in this space. Quantification shows that one-third of items that appeared were religious, compared to two-thirds that were secular (138 vs. 276). Religious items made up a notably larger proportion of items on display between late 2006 and late 2008, peaking in early 2008 with nine religious items compared to six secular ones. Number of religious (red) and secular (blue) items on display in Zvezda between 2000 and 2014. The most common object type was photographs (27% of all items on display), followed by icon paintings (20%), other kinds of pictures (17%), mission and agency patches (11%), flags (8%), and other religious items such as crosses, relics, and books (6%). The photographs primarily consisted of images of Soviet space heroes. Distribution of item types on display in the aft end of Zvezda, 2000-2014. Interesting patterns also appeared with regard to the locations of these types. 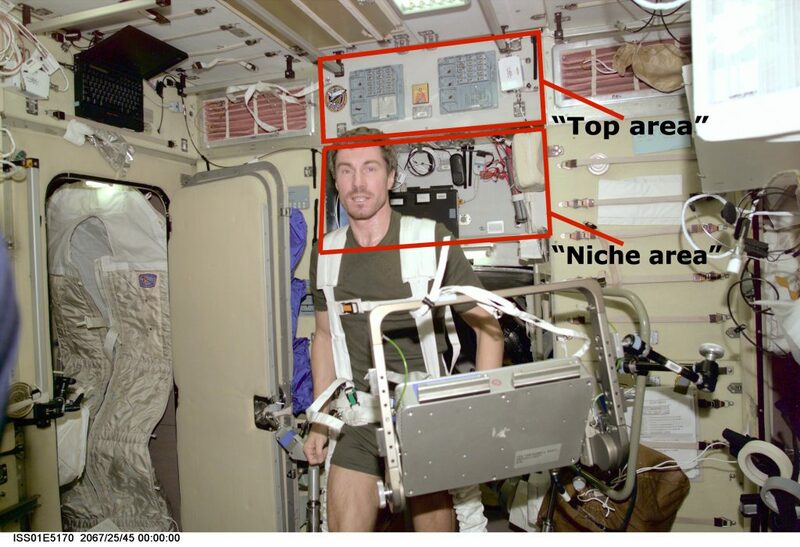 We identified two particularly significant zones of display: in addition to the “niche,” the previously-mentioned set-back area of the aft wall directly over a portal leading to a Soyuz crew vehicle; and the “top area,” located over the niche, which was probably the most prominent zone for items to be placed. Image of Zvezda aft end, showing the “top area” and the “niche area.” Photo credit: NASA. These patterns seem to indicate different meanings associated with the two zones — a mostly secular shrine to space heroes below, and a more religious and nationalistic area up above. Yuri Gagarin holds a dove presented to him by the Bulgarian Young Pioneers, 1961. 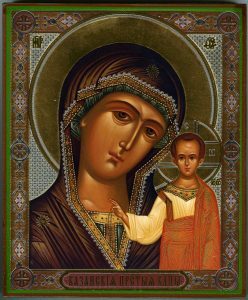 An example of the icon type known as the Mother of God of Kazan. When we look at specific items, other facts emerge. 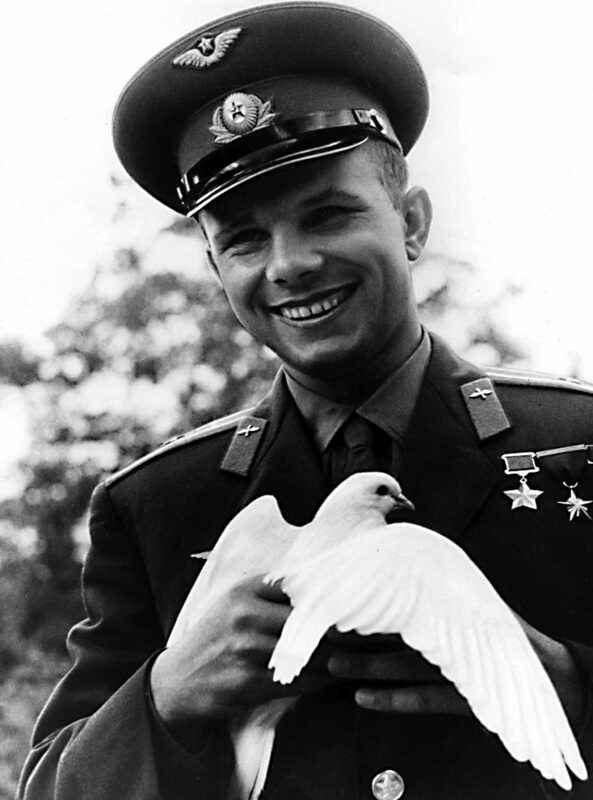 The most common item was a famous photograph of Yuri Gagarin holding a dove. This image was first displayed in 2002, during Expedition 5, and it appeared in every single subsequent photograph taken of Zvezda’s interior from that point forward. All but one of those times, it appeared in the niche (the other time, it appeared in the top area in the center). By contrast, the second most common item was an icon of the Mother of God of Kazan, which appeared 25 times following its first appearance during Expedition 2 in 2001. Half of these times, it was placed in the top center position. A small Russian flag appeared in 19 images (i.e., 40% of the time). This was three times as frequent as the next most common flag. Seventy-four percent of the time, this flag was in the top area, especially top center. These examples seem to underline the our previous conclusions about the unstated significance of the different display zones on Zvezda. 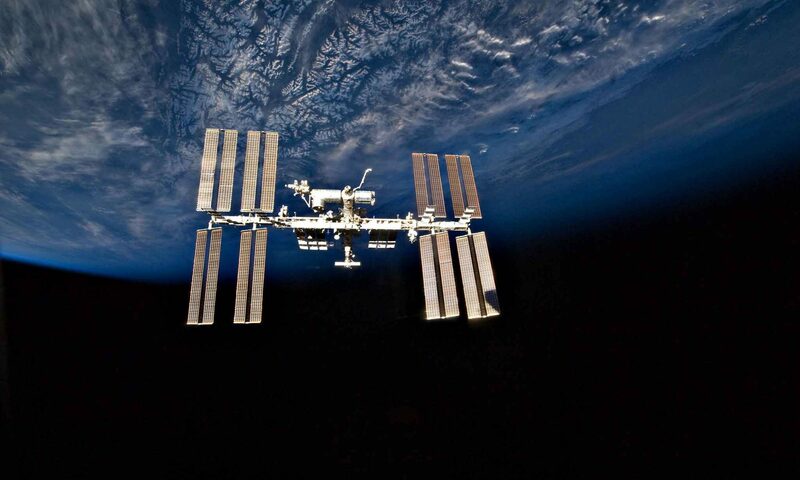 A Ukrainian Twitter feed posted a message mocking the appearance of religious items on ISS. The modified photo shows ISS crew in the fore end of Zvezda. Credit: @ShkvarkiUA. An original image taken at the same time as the modified one tweeted by @ShkvarkiUA, showing cosmonauts holding small icons of St. Nicholas. At top right, a triptych of the Old Testament Trinity with Sergii of Radonezh (who founded the Trinity Lavra church, also frequently shown in paintings in Zvezda) on the left wing, and St. Serafim of Sarov (who was canonized in 1903 at behest of Nicholas II and his wife, and who is highly revered in the post-Soviet church) on the right wing. Photo credit: Roscosmos. This preliminary study has already revealed previously unknown information. We intend to research more deeply into the context of these displays — the particular astronauts living in Zvezda, internal Russian cultural and political developments, relations between Russian and other crew members on ISS at the time, etc. — in order to explain why these patterns occurred. For example, a cursory investigation of Russian news reports and blog posts relating to the appearance of religious items on Zvezda at various times shows that public sentiment is divided with regard to the appropriateness of such displays in the ISS context. Some people approve of increasing the prominence of the Orthodox Church in Russian public life, while others feel that it is inappropriate or even mock it. It is easily imaginable that such contentiousness might also be present within the cosmonaut corps itself, and that disagreements might be visible in the patterns we have observed. Clearly, different crews have made very different decisions about what kinds of things to put on display. We will also make comparisons to other spaces (such as the US Destiny laboratory module, where we have noted that the items on display seem primarily to consist of pennants cheering on the Army and Navy football teams, respectively). Once again, we thank Prof. Wendy Salmond for her help with background information relating to Russian religious items.